ORTELIUS - Typus Orbis Terrarum. ORTELIUS, A. - Typus Orbis Terrarum. Typus Orbis Terrarum. - ORTELIUS, A. Title : Typus Orbis Terrarum.. Size : 13.0 x 18.7 inches. / 33.0 x 47.5 cm. 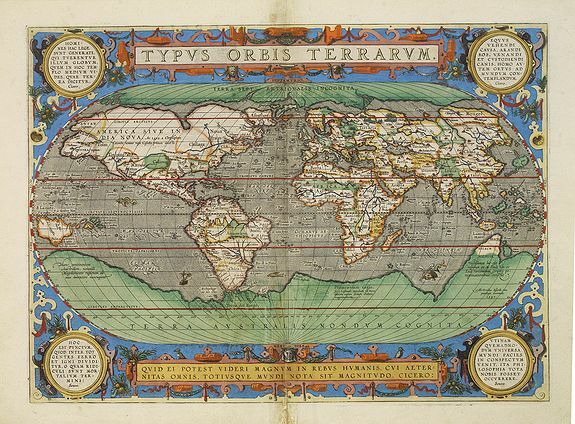 Description :Ortelius' third and last world map is dated 1587 under the author's signature. The earlier border of clouds has been replaced by a more intricate and elegant lattice of strapwork and swag. The oval world map used previously has been updated in two major respects. South America now assumes the more correct shape anticipated in state 3 of Ortelius' second plate, and the Solomon Isles are marked for the first time. However, Ortelius shows the northern mainland's of Asia and America as separated by a narrow strait, 200 years prior to Captain Cook's thorough surveys of the area. California is properly shown as a peninsula. However, the map reflects the misconception held at the time that Tierra del Fuego was the northern tip of a massive southern continent. Indicative of its paramount importance, a copy of Ortelius' atlas is thought to have accompanied Sir Francis Drake on his circumnavigation of the world. Condition : Very good to mint condition. Some minor browning in upper and lower margin along the center fold. Repair of split lower part centerfold, 3cm into engraved area, no paper is missing.